Ever since their launch in India, the 650 twins have been making waves for their excellent engine and smooth ride. Unlike the typical thump from Royal Enfield engines, the company went for a more smoother exhaust note this time. The engine is also a brand new 648 cc parallel twin unit, and it sounds like one. However, there is always some scope of improving the custom exhaust note of a bike of a car and the same implies for the Interceptor 650. Grid7 Customs have unveiled a new custom exhaust set for the Interceptor 650. Let’s take a look at the video below to see how it sounds. There is a huge difference in the exhaust note since the very moment the engine breathes to life. To let you know, the stock exhaust note of the Interceptor is nicely loud and smooth with occasional burbles, but the sound is not overpowering so as to turn heads wherever it goes. Which exactly what Grid7 customs has done with this new set of exhaust. The note has been tuned to be wild and that is what it does. Upon revving the engine, the note is not very bassy but more of a roar. Sharp burbles, roars and occasional bassy notes are the distinct character of the modified exhaust pipes. To let you know, Royal Enfield also has a specialized exhaust marque under its name which makes custom exhaust units for its range of bikes. Called S&S exhaust system, it comes as part of the optional accessories from Royal Enfield. However, it still is not available in India for the 650 twins. The aftermarket fitments like the one we bring you today are also not a lot in numbers, though other companies are now jumping in the bandwagon since the 650 twins are making good sales. Red Rooster also provides aftermarket exhaust options for the Royal Enfield 650 twins. As for the question of performance increment by these exhausts, there is no official statement by the company on the same. However, since it has been called performance exhaust for Interceptor 650 by Grid7 Customs, we expect them to give a slight boost to power and torque figures. However, don’t expect anything over the top and the increase will only be marginal. 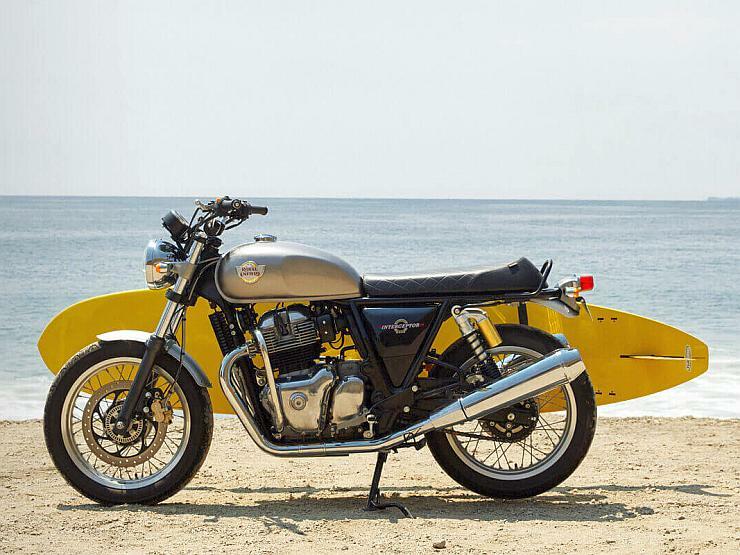 The Royal Enfield Interceptor 650 gets powered by a 648 cc, air-oil cooled, parallel twin engine, which is a newly developed unit by the company. The engine churns out 47 Bhp of power along with 52 Nm of torque, making it the most powerful bike in its price range and above. The relaxed stanced and retro-styled bike comes with a 6 speed gearbox and also gets slipper clutch. The bike has been made on an all new double cradle chassis which is quite sturdy and gives the bike a well balanced ride. The bike is more easy to ride over long distances than its more sportier twin, the Continental GT 650. With the new exhaust by Grid7, it even sounds better and becomes more of a joy to ride.